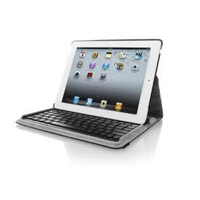 The Apple iPad 2 is an incredibly versatile tablet, but typing on it is not always the most easy task. But with the Targus Versavu Keyboard and Case, you can swivel the iPad to the most comfortable position and type quickly on a wireless Bluetooth keyboard. It would be nice to have a smart case with a magnet that automatically puts the iPad in sleep mode when it closes, but with this model you have to physically press a button. Regardless, the design is creative, blending a professional style with versatile functionality. As a nice bonus, the case includes a holder for the stylus. It’s available for $73.21.